Renting Bespoke Fashion, Stylish Daily-Wear and even Pret Couture to the customers. In today’s era when high-end Fashion labels are desired by everyone, but many people cannot afford it due to exorbitant prices; Shilpa Bhatia understood this problem, and decided to launch a platform that can help every buyer afford Fashion, at their doorstep. But such bridal-pret and couture dresses come at high prices, and that is what her startup The Clothing Rental is solving for the customers. Shilpa Bhatia elaborates,”Before starting The Clothing Rental, I was an established fashion and costume stylist for ad films, press campaigns and more. Very often we had a need for fine clothing on shoe string budgets. Since a shoot only lasts a few days, buying something didn’t make relevant sense. We also had limited availability of western trends, I noticed certain key pieces were in high demand and often expensive. Initial challenge was to convince people that one can rent high fashion clothes for cheap. Many ridiculed the concept by calling our products fake or replicas. That was discouraging, but you can’t let others ignorance disturb your inner peace. Once they realized the product is great yet they get it cheap, often they don’t respect the product. So I would say educating the consumer is a big challenge. As the consumer is a certain mindset that can be detrimental to a good business. Yet customer is always right, so learning to balance the fine line is a big one. Second challenge is that when people notice you do something well, they want to copy you. We’ve had many come in to our stores, pretend to be clients and then go ahead and copy everything we do. I take this as a compliment as first people ridicule you, then they imitate you and finally they step out of the way and respect you. The ball has started rolling. Shilpa borrowed a small seed capital of 10 lakh rupees from her very first investor and went on a shopping spree. Soon, she had to add more funds. Luckily for her, she money by styling and not having any real income through the rental. 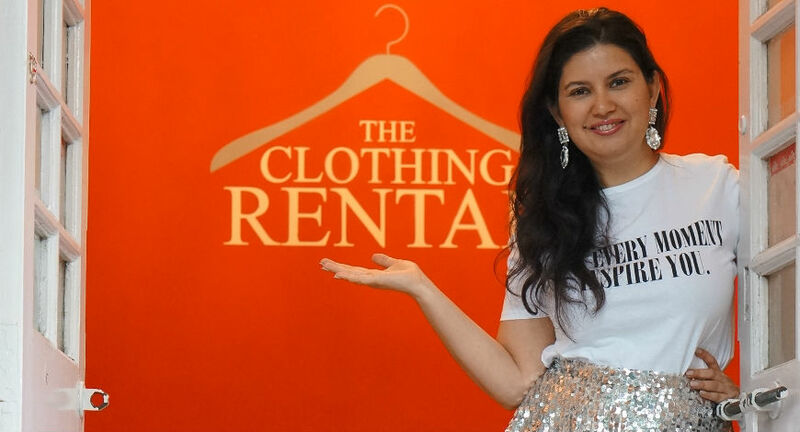 Shilpa thinks that, the concept of renting clothes did not exist a decade ago and today the times are changing,“I started my journey in 2005, when renting dresses was not considered even a viable option. Currently renting clothes have become a preferred viable option. We attract a new client everyday, that goes to show that more and more people are opening up to the concept of renting,” Bhatia elaborates. She adds that often times the need for a fancy outfit is temporary and then it collects dust in a limited closet space in an urban city. Currently her focus is to create awareness and generate new clientele, Bhatia says the years in-between has seen a considerable change in the people who come to her for their fashion needs. India is an immense market, it’s a diamond mine waiting to explode. There is a market for retail and then a secondary market for rental or resale. We have 3 verticals : Menswear , Womenswear and Indian wear. The Indian wear is targeted for the bridal industry, that market size is 100,000 crores Menswear market is stated to grow 9% per annum and reach a 1,76,000 Crore by 2020. As for Womenswear, we all can notice that the western wear category is getting well accepted in conjunction with the ethnic wear. And I believe that we will achieve growth in all three verticals, being a decade into the business we have learnt which vertical to focus more on and which trends to pick on. Our aim is to get a small share of the enormously big pie, the small share might not be that small once put in perspective. Kanchan loves to watch movies, purchase products that people don't buy, read about startups and write about the inspiring journeys. Two Brothers’ Journey to Redefine Manliness in the Modern Era: One Leather Jacket at a Time.